The man of the moment, Philippe Coutinho is already at Nou Camp ahead of his official unveiling by Barcelona on Monday. Barcelona have announced how Monday's activities will go as they welcome the Brazilian playmaker into their fold. 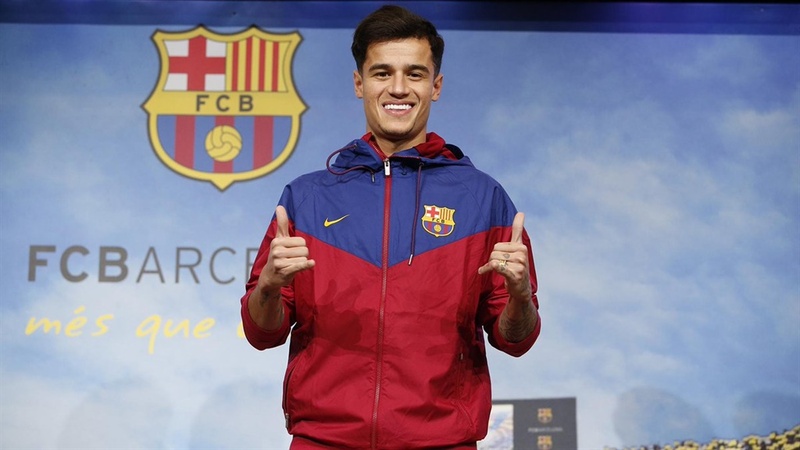 As stated on the Barcelona website, the contract signing by Coutinho will take place in the Presidential Anteroom at about 11.30 am Nigerian Time. The Official presentation in the Roma Lounge is to take place thirty minutes after the contract signing formalities. It is also announced that there will be a Photo shoot on the pitch at the Camp Nou open to the public but with limited tickets while the day's activities will end with a press conference in the Auditorium 1899. Speaking to Barça TV about his arrival in Barcelona. Coutinho said: “I am very happy. I have always said I am living a dream, we are very happy to be here. To be able to play football, win titles, make the fans happy and play with a smile. These are the objectives"
The Catalan giants are believed to have agreed to a deal worth up to £142 million with Liverpool to bring the Brazilian playmaker to Camp Nou.